A rare screening of the 2015 documentary, ‘Generation Right’, will take place on Thursday 4 May at 18.00 in the Diamond at the University of Sheffield. It will then be followed by a panel discussion of the issues raised in the film involving a number of eminent speakers. ‘Generation Right’ shows how the UK has been profoundly changed by Margaret Thatcher’s long period of office as Prime Minister. The documentary, directed by Michelle Coomber and based on the research of Colin Hay, Will Jennings, Emily Gray and Stephen Farrall, brilliantly mixes archive footage and interviews with key political figures of that era, including Michael Howard, Douglas Hurd and David Blunkett. 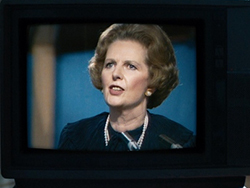 The film captures the profound sea change orchestrated by Thatcher with a view to creating ‘a climate of opportunity and enterprise’ and explores in full the consequences of many of the key ‘Thatcherite’ policies of the 1980s. The screening of the documentary, which lasts 41 minutes, will be followed by a panel discussion and then Q&A. We are delighted to announce that the panel will be made up of: The Rt Hon David Blunkett MP; Baroness Lister of Burtersett, Professor of Social Policy at Loughborough; Andy Beckett, journalist and author of ‘Promised You A Miracle: Why 1980-82 Made Modern Britain’; Andrew Gamble, SPERI Professorial Fellow; and Stephen Farrall, Professor of Criminology at the University of Sheffield and one of the key figures involved in the making of the film. Generation Right Trailer from MEDINA FILMS on Vimeo.